Recently, I had the opportunity to participate in a live tasting of wine from the Carinena D.O.P. (Denominación de Origen Protegida) of Spain (like AVA, AOC, DOGC QVA). Wine was sent for evaluation to participants and I eagerly agreed, having tasted wines from this region before. Less well known than Rioja or Ribera del Duero, or perhaps even Rias Baixas or Jumilla, Carinena is a coming region and grabbing the attention of trendy Somms. Romans established the villa of Carae (later called Carinena) in 50 B.C., so it’s amusing to think of this region as the “coming thing.” The D.O.P. of Carinena is located in the heart of the Ebro Valley in N.E. Spain, bordered by the Pyrenees and France to the north and Catalunya to the east. By 1415, King Ferdinand I of Aragon declared a preference for the wines from Carinena referring to them as “above all others.” Flash forward to 1932 and Carinena is recognized by Spain for its unique terroir and awarded “Denomination of Origen” status (the second such in all Spain). rock and pebbles, beneath which is a bed of limestone and clay. 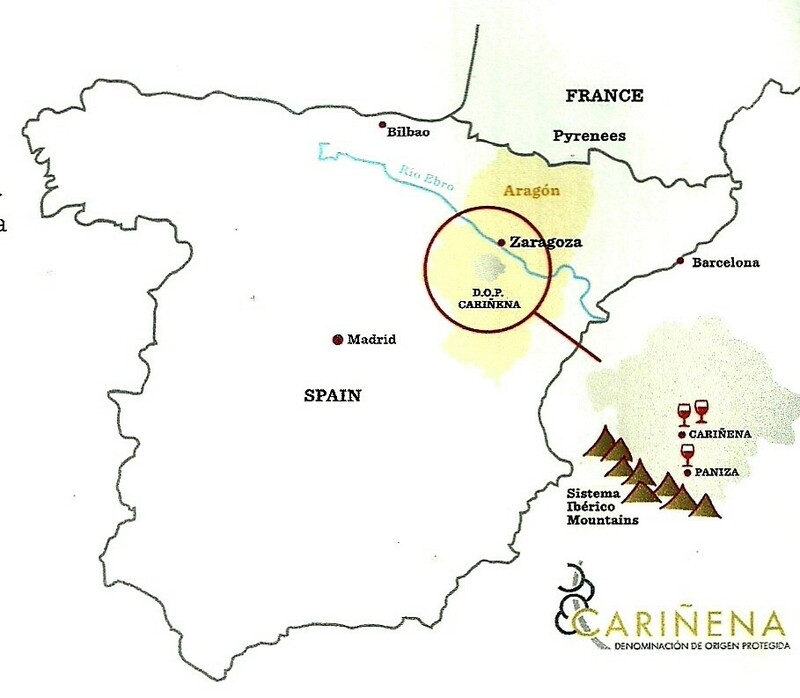 In fact, wine from Carinena is known in Spain as “El Vino de las Piedras” (wine of the rocks). Nutrients wash down from the landscape’s sloping hills at elevations of 400-800 meters (1312-2624 feet) into the windswept valley. Despite the proximity of the area’s three rivers, the wind currents from the “Cierzo” contribute to the vines’ disease resistance. Temperatures drop significantly at night. Winters are harshly cold. Garnacha (Grenache) has long been grown here and thrives, producing wines with a true sense of place. Carinena’s 29 wineries produce everything from Joven reds to Crianza and Gran Reservas from vines that may average 80 years. Within this Denomination of Origen are obviously several microclimates making site selection for viniculture a challenge but capable of bringing forth wines of distinction. I’ve tasted many Gran Reservas, Reservas and some Crianzas. What excited me about this label was its “entry label” pricing and that it was a Joven. As with all wineries, Bodegas San Valero (a cooperative) produces many wines at different price points. Joven (meaning young) wines see little or no oak aging and vines used for this label average only 20 years of age (youngsters by Carinena D.O. definition). The blend is 60% Garnacha, 30% Tempranillo and 10% Cabernet Sauvignon. I was happy to see Garnacha dominant in the blend, but concerned that the unaged Cabernet Sauvignon might produce green notes. I was concerned needlessly. In the glass, this garnet colored wine with fast moving tears offered aromas of mashed blackberry, new leather and brandied cherries with notes of white pepper. A faint hint of green pepper (but not unpleasant) was in the taste, accompanied by forest berries. Fruit was definitely “old world” in style and there was some heat on the finish. But the magic of this young wine became evident as it does so often in Garnacha based blends from this region when given air. Tannins were rounded even opened and poured. But with air, the wine’s fruit developed. The nose was more concentrated with black fruit. Blackberry became more evident in the taste and some spice and cassis developed as well. For such a young wine, made to be enjoyed as such, its development impressed me. So did its price: under $10 U.S.
Bodegas San Valero was founded in 1944 by 60 winegrowers in the Carinena region and benefits from having access to the most prominent vineyards in the region. Garnacha accounts for 31% of the D.O’s. production. On a quality to price ratio, this Castillo Ducay, as did other wines I’ve tasted from the Carinena D.O., offers extreme value. Carinena delivers a clear expression and sense of place in bottled Garnacha. It’s affordable and a crowd pleaser, amazingly food friendly and a perfect accompaniment to barbeque with its fruit to acid balance. Pair it with roasts, stews and red sauced or grilled chicken or tapas (no surprise). Wine.com referred to wines from the Carinena D.O. in Spain as being “crowd pleasing” with “Carinena being the next big thing.” Wine & Spirits said “Carinena is a place for discovery.” The SOMM Journal stated, “Fruit forward Garnacha at a value price point, these are wines for every day.” Personally, I find them a bargain and with a profile sharing the medium tannin, medium acidity and fruitiness of Merlot, but with an old world style of fruit, less forward, more refined - particularly as they evolve with air. In another sense, Garnacha from Carinena falls between Nebbiolo and Merlot in style, with Merlot becoming more evident as the wine airs. When a Joven can do all this, it speaks well of the grape’s roots. Like Wine Mizer on facebook for mini wine reviews, industry news, fun facts, occasional puzzles, food and wine pairing suggestions and more. Vines for this bottling are grown at an elevation of 2,100 feet, sourced specifically from the Monte Ducay vineyard, one of the most characteristic terroirs in Carinena . Maceration is 14 days at 76-82 degrees F followed by fermentation for 7 days. Juice is unoaked. ALC 13.5%.